Sailor Moon (美少女戦士セーラームーン Bishōjo Senshi Sērā Mūn?, originally translated as Pretty Soldier Sailor Moon and later as Pretty Guardian Sailor Moon) is a Japanese shōjo manga series written and illustrated by Naoko Takeuchi. It was originally serialized in Nakayoshi from 1991 to 1997; the 52 individual chapters were published in 18 tankōbon volumes. The series follows the adventures of Usagi Tsukino as she transforms into the titular character to search for a princess and an artifact called the "Legendary Silver Crystal" (「幻の銀水晶」 Maboroshi no Ginzuishō?, lit. "Phantom Silver Crystal"). 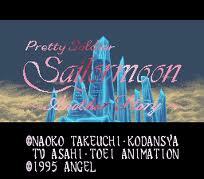 During her journey, she leads a diverse group of comrades, the Sailor Soldiers (セーラー戦士 Sērā Senshi?) — Sailor Guardians in later editions — as they battle against villains to prevent the theft of the Silver Crystal and the destruction of the Solar System. Bishoujo Wrestler Retsuden: Blizzard Yuki Rannyuu is a Strategy game, published by KSS, which was released in Japan in 1996. 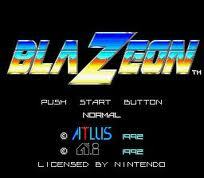 BlaZeon: The Bio-Cyborg Challenge (ブレイゾン?) is a horizontally scrolling shoot 'em up arcade game released by Atlus in 1992 and was ported to the Super NES in the same year. The game's most distinguishable feature is that players come equipped with a device that allows them to freeze and control certain robots. The Blues Brothers is a video game based on the band The Blues Brothers, where the object is to evade police in order to make it to a blues concert. The game was released for IBM PC, Amstrad CPC, Amiga, Commodore 64 and Atari ST in 1991, for the NES in 1992 and for the Game Boy in 1994. 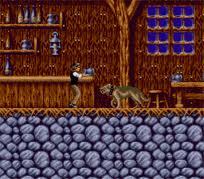 It was created by Titus and in gameplay is reminiscent of Capcom's Chip N' Dale series (1990), as well as Titus' own Titus the Fox. 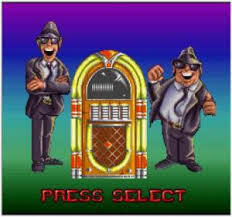 A sequel, Blues Brothers: Jukebox Adventure, was released for IBM PC and SNES in 1993 and for the Game Boy in 1994. Bobby's World (originally known as The World According to Bobby, to parody The World According to Garp) is an American animated television series, which ran from 1990 to 1998, on FOX Kids. It was about the daily life of Bobby Generic (/ˈdʒɛnərɪk/ GEN-er-ic) and his very overactive imagination on how he sees the world. The show was created by Canadian actor-comedian Howie Mandel. Mandel also provided the voice of both Bobby and his father Howard Generic, who looks like a cartoon version of Mandel himself. It was produced by Film Roman for Alevy Productions and FOX Kids Productions. The theme song for Bobby's World was composed by John Tesh, along with Michael Hanna. 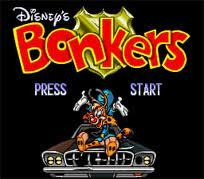 Bonkers is an Action game, developed and published by Capcom, which was released in 1994. 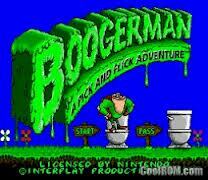 Boogerman: A Pick and Flick Adventure is a 2D platform video game created by Interplay Entertainment and released for the Sega Mega Drive/Genesis in 1994 and later on the Super Nintendo Entertainment System (SNES) in 1995. The Genesis version was also released on the Wii Virtual Console in North America on November 24, 2008 and in Europe on December 12, 2008. The game's lead character also made a cameo appearance as a playable character and the rival of Earthworm Jim in Interplay's ClayFighter 63⅓. Boxing Legends of the Ring (known in Japan as ファイナルノックアウト (Final Knockout?)) is a boxing video game for the Mega Drive/Genesis and Super NES consoles. 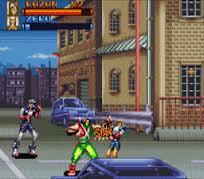 The boxers are represented by 2D sprites seen from over the shoulder of one of the fighters. The title of the game refers to the famous boxing magazine, The Ring, which the game is licensed to associate itself with. The following famous middleweight boxers are represented in the game: Sugar Ray Leonard, Roberto Durán, Thomas Hearns, James Toney, Marvin Hagler, Jake LaMotta, Sugar Ray Robinson, and Rocky Graziano. All of the fights in the game take place in the Las Vegas Hilton casino in the North American version. There are also advertising banners for HBO visible during fights that are not available in the Japanese version. In the Japanese version, the game takes place in a generic boxing ring using the publisher's name in place of the HBO advertisements found in the North American version. Even in the Japanese version, the options are mostly in English. A special version was released in Mexico called Chavez II; the game exchanged the English language words for Spanish and omitted some vocals. 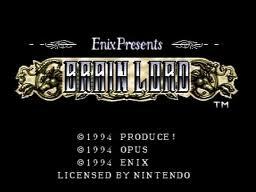 Brain Lord (ブレインロード?) is an action role-playing video game published by Enix for the Super NES. It was only released in Japan and North America. Bram Stoker's Dracula is a video game released for the NES, SNES, Game Boy, Sega Master System, Mega Drive/Genesis, Sega CD, Sega Game Gear, DOS and Amiga games consoles. Based on the 1992 movie of the same name, each version of the game was essentially identical (except for the Sega CD, Amiga and MS-DOS versions). The Amiga version was released in 1994 for North America and Europe. A CD-ROM version for DOS was released in 1995. Brandish (ブランディッシュ?) is an action role-playing video game by Nihon Falcom. Originally released in 1991 for the NEC PC-9801 and FM Towns, it was later ported to the Super Nintendo Entertainment System (SNES) and PC Engine CD-ROM² (TurboGrafx-CD) in 1994-1995, including an expanded re-release titled Brandish Renewal. 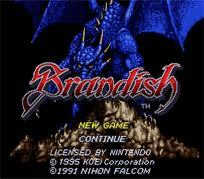 The only English language version of the game is the SNES version, which was published by Koei in Japan in 1994 and in North America in 1995.Brandish was the first title in Nihon Falcom's series of the same name. It was followed by three sequels: Brandish 2: The Planet Buster, Brandish 3: Spirit of Balcan, and Brandish VT / Brandish 4, originally released between 1991 and 1996.A complete remake of the original Brandish featuring 3D graphics was released for the PlayStation Portable in 2009, titled Brandish: The Dark Revenant (ブランディッシュ～ダークレヴナント～?). Brawl Brothers, known in Japan as Rushing Beat Ran: Fukusei Toshi (ラッシング・ビート 乱　複製都市, "Rushing Beat Chaos: The City of Clones"? 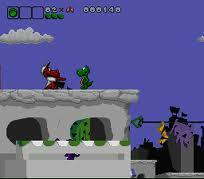 ), is a side-scrolling beat 'em up game made by Jaleco in 1992 for the Super Nintendo Entertainment System. It is the second game in the Rushing Beat series, succeeding the first game in the series, known as Rival Turf! outside of Japan. Versions of the game's box in certain European countries promote the game as Rival Turf 2.It is the only known SNES game that features the Japanese version on the same cartridge, accessible through use of a cheat code. 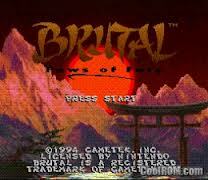 The Japanese version of the game features different character names, no maze-like stages, an expanded ending sequence and the addition of a groin kick move for playable character Douglas Bild.The game was followed by the release of The Peace Keepers in 1993. Breath of Fire (Japanese: ブレスオブファイア, Hepburn: Buresu obu Faia?) is a role-playing video game series developed by Capcom. It originated on the Super Nintendo Entertainment System in 1993. The series is notable for its recurring characters and ambiguous continuity; though each game is its own self-contained story, the names of the two lead characters are, invariably, Ryu and Nina.The story commonly involves an adventurer named Ryu who can shapeshift into different types of dragons. Over the course of his journey, he befriends Nina, a girl with wings. 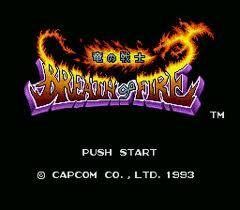 At its inception, Breath of Fire took place in a medieval fantasy style fictional world. Following the mainstream success of Japanese role-playing games in the 1990s, the series began using the original anime-style artwork for later Western releases of the games (rather than the Westernized art that was drawn specifically for the Western releases of the first two games), post-apocalyptic themes, and an increased emphasis on character development. Despite these changes, the core structure of Breath of Fire remains largely linear and plot-focused. As of 2003, five Breath of Fire titles have been released, with three games being ported to handheld game consoles as well as Nintendo's Virtual Console. To date, the series has sold over 3 million units worldwide. Breath of Fire II (Japanese: ブレス オブ ファイアII 使命の子 Hepburn: Buresu obu Faia Tsū: Shimei no Ko?, Breath of Fire II: The Destined Child) is a role-playing video game developed and published by Capcom. 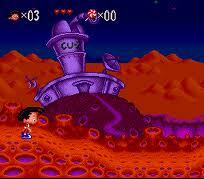 First released in 1994, the game was licensed to Laguna for European release in 1996. 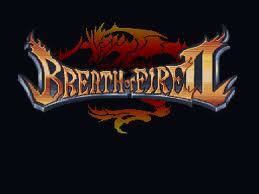 It is the second entry in the Breath of Fire series. It was later ported to Game Boy Advance and re-released worldwide. The game has been rated by the ESRB for release on Wii's Virtual Console and was released in North America on August 27, 2007. Nintendo of Europe's website mistakenly announced it for release on July 27, 2007, but it was in fact released two weeks later, on August 10, 2007.Unlike later installments in the series, Breath of Fire II is a direct sequel to Breath of Fire. Set 500 years after the original game, the story centers on an orphan named Ryu Bateson, whose family vanished mysteriously long ago. After his friend is falsely accused of a crime, Ryu embarks on a journey to clear his name. Bronkie the Bronchiasaurus, also known as Bronkie Health Hero, is an educational Super Nintendo Entertainment System platform video game published by Raya Systems. that takes place in a prehistoric city. It is a part of series of educational video games from Raya that includes Captain Novolin, Rex Ronan: Experimental Surgeon and Packy and Marlon. Brutal: Paws of Fury (known in Japan as Animal Buranden - Brutal (アニマル武乱伝 ブルータル?)) is a fighting video game published by GameTek Inc. in 1994. The game features a full cast of anthropomorphic animals as selectable fighters. 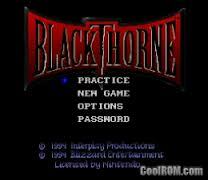 The game also featured an ability to learn new moves and save them via a password feature.